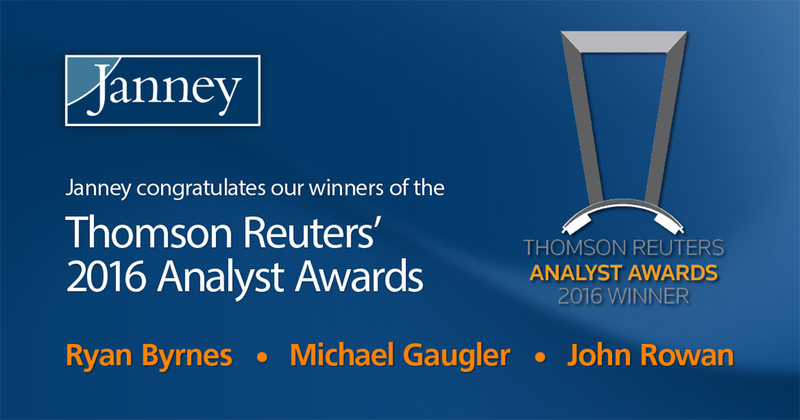 Philadelphia, PA – July 7, 2016 – Janney Montgomery Scott LLC (“Janney”), a leading full-service wealth management, financial services and investment banking firm headquartered in Philadelphia, PA, today announced three of its analysts – Ryan Byrnes, Michael Gaugler, and John Rowan– are recipients of 2016 Thomson Reuters Analyst Awards, which are presented to the top individual sell-side analysts and firms in the industry. Ryan Byrnes, Director – Insurance, was awarded the top overall stock picker for insurance. Michael Gaugler, Managing Director – Utilities and Infrastructure, ranked as the number three earnings estimator for water utilities. John Rowan, Director – Specialty Finance, was awarded the number one overall earnings estimator for consumer finance. The Thomson Reuters Analyst Awards recognize the top performing stock pickers and earnings estimators in the industry, which is determined based on the returns of award candidates’ buy/sell recommendation relative to industry benchmarks and the accuracy of their earnings estimates in 16 regions around the world.